I first heard English songstress, Amy Winehouse, on Zane Lowe’s BBC Radio One show (where I have found more gems than not), but not because I was interested in her. Ms. Winehouse’s breakthrough single, “You Know I’m No Good”, featured the only and only, Wu Tang Clan member, Ghostface Killah (the best rap name ever!). Of course, Ghostface held his own in a story of lovers that aren’t meant to be, but I was eager to find more from this soulful newcomer. On Amy Winehouse’s sophomore album, “Back to Black”, Winehouse elicits her listeners attention with a style that is reminiscent of a ’60’s girl group with tales of modern frustration and angst. Production was done with the help of her past executive producer, Salaam Remi and renowned DJ Mark Ronson. Ronson’s pop appeal (past work includes Lily Allen and Nikki Costa) seems have been the perfect complement to Winehouse’s jazz background. “Rehab” has the kind of sarcastic humor that U.K. belle counterpart, Lily Allen, would be proud of. But this is where the similarities should end. Amy Winehouse defiantly belts out her protests to the call and response chorus, whereas Lily Allen’s soft, airy voice would lightly spit this tongue-in-cheek anthem. The song is also fitting with Winehouse’s recent allegations of public drunkenness and brushes with the law. The previously mentioned track, “You Know I’m No Good” (sans Ghostface Killah), shines on the album with the Brit’s warning to her suitor as to what to expect. Seductively, she states “I cheated myself/like I knew I would/I told ya, I was troubled/you know that I’m no good” over a jazzy, brass-filled backing. The reoccurring theme throughout the album is relationships gone sour, and Winehouse knows exactly how to evoke those emotions through music. “Me and Mr. Jones (F***ery)” is a rant about an on-again, off-again exchange complete with a Supremes-style doo wop effect. “Back to Black” shines as a scathing jab at a former lover, who ended their affair by returning to his former partner. The track has a menacing bass line with a pulsing piano that effectively supplements the despair she feels. Winehouse hauntingly details her fall into the break-up abyss with the lyrics “We only said good-bye with words/I died a hundred times/You go back to her/And I go back to.” The gem of the set has to be “Love Is A Losing Game”. With eloquently arranged string and piano sections, you can almost see her pouring her heart out in a swank jazz lounge, under a bright spotlight, while onlookers sip gin and cognac. 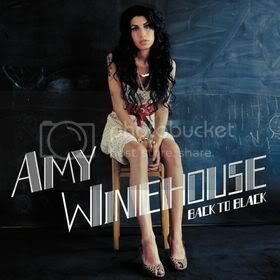 The only drawback to “Back to Black” is the short run time of 35 minutes (10 tracks + “You Know I’m No Good” remix). The listener will be asking for more of Winehouse’s ability to lace jazz + girl-pop influenced rhythms with stunning vocals and pure emotion (Someone should call Kanye West to arrange a Lauryn Hill/Amy Winehouse duet). Look to hear Amy Winehouse’s name come up as one of the starlets of 2007.